The newest addition to Selma, Alabama is the Holiday Inn Express Hotel & Suites of Selma, AL Our 100% non-smoking hotel is conveniently located on US Highway 80 West, just a short drive to downtown Selma, 45 minutes from Montgomery, AL and less than 90 minutes from Birmingham, AL. 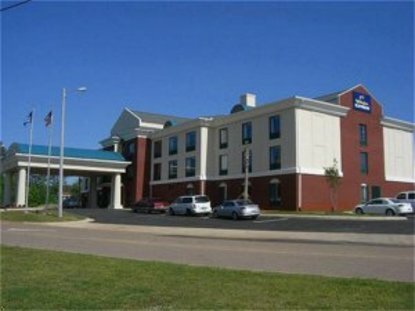 With our world class service and many Selma businesses, restaurants and attractions within a short drive from our front door, you&regll discover why our guests have selected us as their preferred hotel in the Queen City of the Blackbelt This state-of-the-art hotel features special in room amenities such as free high-speed Internet access. Whether you are staying with us for business or pleasure, take time to relax and enjoy our outdoor swimming pool. Points of interest Companies: International Paper, Bush Hog, Craig Industrial Field Hospitals: Vaughan Regional Medical Center Universities: Judson College, Marion Military Institute, Concordia College Local attractions: Edmund Pettis Bridge, National Voting Rights Museum, National Slavery and Civil Rights Museum, Brown Chapel AME Stay Smart at the Holiday Inn Express Hotel and Suites Selma, Alabama This hotel is committed to providing accessible facilities under the American Disabilities Act. If your accessibility needs are not met, please contact the Hotel Manager on Duty. Should you require additional information regarding accessible facilities for guests with disabilities, please call 1-800-Holiday (U.S. and Canada) or contact the hotel directly. For the hearing impaired, TDD service is available at 1-800-238-5544 within the U.S. and Canada.